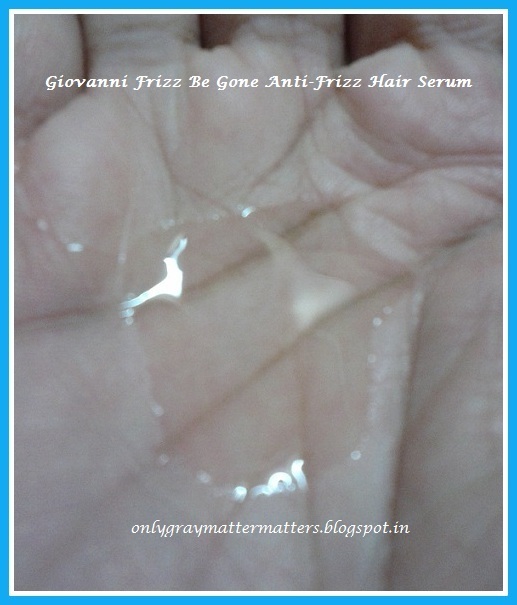 This is a review of Giovanni Frizz Be Gone super smoothing anti-frizz hair serum with Eco Chic Technology. 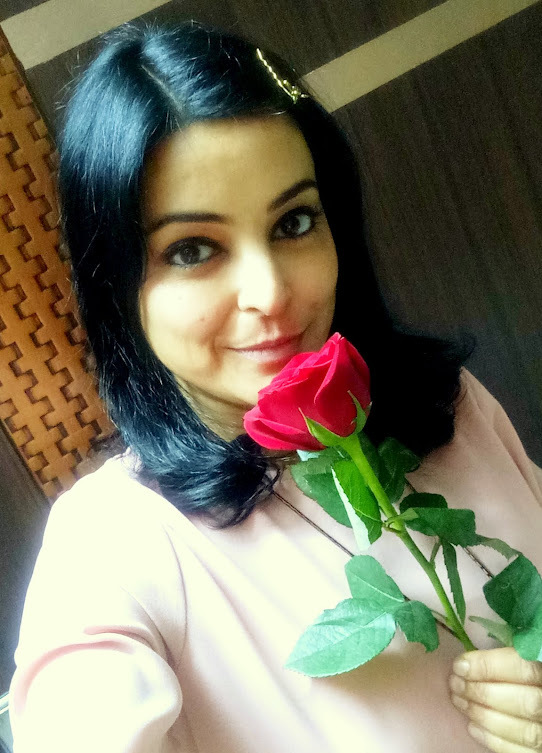 By now you all may be aware of my love for hair care products and how I always keep looking for better products with less chemicals. The same search this time led me to the organic hair care brand Giovanni, which claims 100% Vegetarian ingredients and no harmful chemicals. I bought this hair serum from an online store where the description said "A super smoothing anti-frizz serum. This liquid style creates the perfect sealant: control frizz, add shine, infuse with conditioners and lock in hair color. 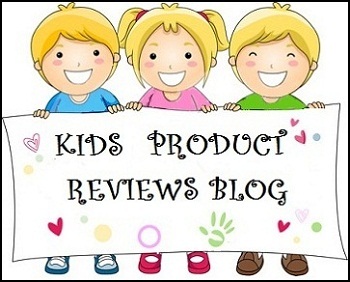 Perfect for all hair types, especially dry and colored hair." 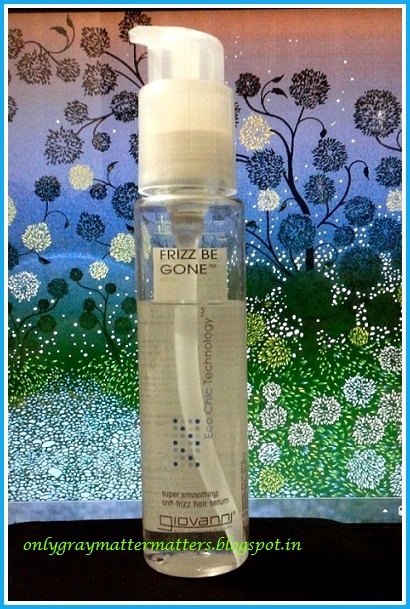 Giovanni Frizz Be Gone hair serum comes in a transparent plastic bottle with a lockable pump. Just twist the beak of the pump a little to the left and it locks, but the lock is not tight enough for spill-proof traveling. through wet or dry hair. May be used with blow dryer for straightening. Eco Chic TechnologyTM: The elements of earth, wind, fire and water represent a unique combination of certified organic botanicals and incredible style. 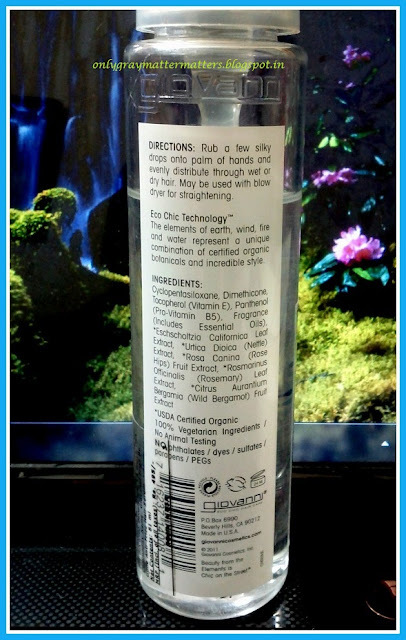 I was super excited to try a chemical free product that claimed to give super smooth hair. With very high hopes, I started using Giovanni Frizz be Gone hair Serum in Aug 2012. Aug and Sept are high humidity months in North India, when hair become really frizzy and fluff up in volume. So it was the best time to test this hair serum. I used it religiously for 2 months and finally gave up. It fell flat in the face of all its tall claims. I don't cut my hair at all, so lower ends need a hair serum for smooth combing. It could not tame my frizzy hair. Even after applying this serum, hair remained quite fluffy and difficult to comb. The directions tell you to evenly distribute through hair, but its consistency is such, even distribution is just not possible. This is one product I just could not figure out the perfect way to get proper application. The serum settles at different places in the hair length. You can see patches where there is serum and dry hair in other places. Even if you run a wet comb to spread it, it does not spread. You need to literally 'wipe' your hands hard on your hair for the serum to transfer to frizzy hair and spread properly. A lot of product still remains on the palms causing wastage. Contains dimethicone (silicon oil). Instead of getting absorbed into the hair and providing any nutrition, Dimethicone actually forms a plastic-like coating on the hair. So if you already have dry, undernourished hair, it will actually prevent your hair from absorbing any natural moisture from the air, thus worsening your hair condition gradually. The only thing this is good at is hair styling. But that too once or twice after hair wash. Within three usages after hair wash, hair start looking dirty with thick strands of hair sticking together.You look like you haven't washed hair for 10 days! It smooths hair to a small extent but the effect does not even last 24 hours. Each hair strand looks separate yet very thick, hardened and heavy. The package says 'may be used with blow dryer for straightening, but I feel that would make your hair look like you have applied diluted gum or have starched your hair. This serum gives absolutely no shine to the hair. Forget nourishment, all my hair ends look white, starched, dry and wavy like nylon fibers. My hair have become so undernourished that I am shocked to see countless hair strands with 5-6 splits in each hair. Even chemical-based L'Oreal hair serums did not damage my hair like this one did. I have no idea what their trademarked Eco Chic Technology means.The definition just went over my head. It claims to be America's #1 organic hair care brand. But it is ridiculously high priced in the name of an organic brand. Even if it be priced at 1/5th the current price, I will never repurchase it. I had even bought a hair spray from Giovanni, which also I regret buying within one use, because it burns into my scalp. My personal experience with this one has not been good. 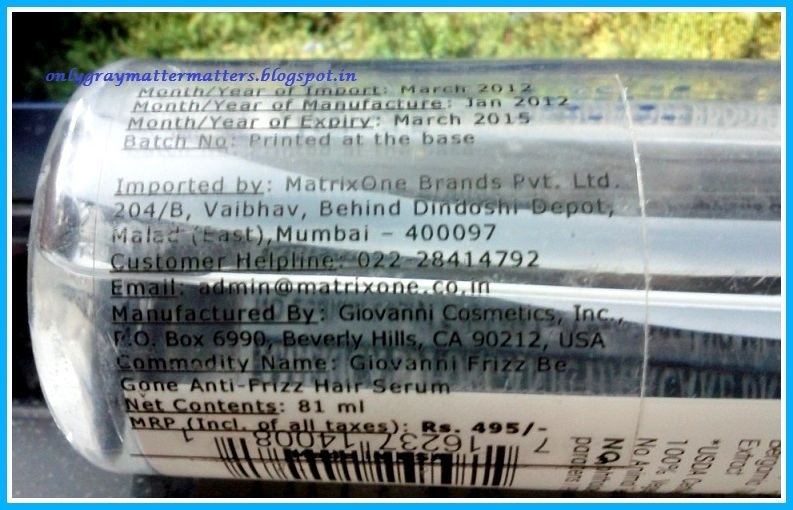 I am sure other hair serums contain dimethicone too, but this one just did not give me any positive results. I have not tried this on wet hair yet, as I use Vidal Sassoon Color Care hairtreatment on wet hair. But I will try this on wet hair and update the review, if I see any better results on wet hair. If you have very healthy thick hair, this may work for you, but I still won't recommend it because it is just not worth the price you would be paying for. Thanks Ruby. Yeah, me too will never repurchase it. But it is a good styling serum for braided hairstyles. I have used the Loreal serum and the oil serum.. they were decent enough. Thanks Niesha. I have read about the oil serum on some online store, though not sure which brand it is. Oil serums fade my hair color so can't try them. I use this a lot and I love it. However it's important to note that I'm in a different climate to you, I live in Australia. I have thick, damaged, colour treated hair which I have to get thinned often or I get migraines. I use this on my wet hair after showering at night and since I started using this I'm able to better manage my hair. I now have soft, smooth, and healthy hair. Perhaps you should point out that this product is designed to be used in the US which has a less humid climate as I believe that the high humidity in India has a lot to do with why it hasn't worked as well for you. Also you should keep in mind that brands like L'Oreal have more chemicals and are tested on animals. Any brand sold in China must be tested on animals before being alowed in stores in China. I'm not sure if you're concerned about this particular issue or not but the main reason why I use this brand is because it's cruelty free, vegan, and adfordable.